Chicken is America’s “favorite” meat, so here’s a recipe that combines our poultry pal with America’s Crock Pot! This is one of our favorite recipes to make for parties or picnics. It doesn’t get much easier than this, people! Add the oil and onion to the crock pot. Top with chicken breasts and then the sauce. Set the Crock Pot at high for about 4 hours or low for 8 hours…depends on how much time you have on your hands. I like to cook low and slow. Once the chicken is cooked, remove and shred with a couple of forks. 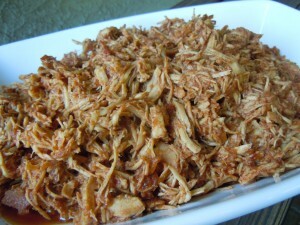 Place the shredded meat back into the saucey pot and stir. It’s ready to serve now! Serve with small toasted rolls or big buns! Great topper for Southwest Taco Salad!